For distributors, the day of the Excel spreadsheet is over. According to the MHI annual report, 80 percent of supply and manufacturing industry leaders believe supply chain digitalisation will be the norm in five years; 16 percent think that day is already here. This trend isn’t new. Most distributors are already using some form of software to monitor stock. However, to remain competitive, distributors will need more; the future of distribution requires software that can provide real time visibility over the entire supply chain as part of a wider network. While digitalisation is the new watchword, it is a broad term. Robotics, Cloud computing and vehicles are all subject to the move towards digital technology. However, in supply chain management, there are three key areas: supply chain optimisation, predictive analytics, and Cloud computing and storage. Distributors need to know the difference between digitisation and digitalisation to remain competitive. Digitisation refers to the process of moving physical documents such as ledgers, purchase orders and records onto computer files. Digitalisation means integrating physical processes with digital data to create a fully optimised supply chain. The over-reliance on Excel spreadsheets is a continuing issue. According to a survey undertaken by Capgemini in 2016, while 50 percent of respondents recognised the need for supply chain digitalisation, only 5 percent were happy with their progress. Supply chains no longer exist exclusively in one country. Relative cost considerations mean that suppliers, distributors and customers are often part of a long, complex, multi-national supply chain that is under diverse control. This makes overseeing the entire supply chain complex. Consumers expect goods sent to their doors. The prominent rise of eCommerce companies such as Amazon has seen the spread of distribution hubs and the increase in complex supply chains with virtual online shops. Consumers will go where they can find the best prices and the best service – they want goods cheaply and quickly. The need for quick and accurate order fulfillment has driven the move towards supply chain optimisation. While many organisations use Enterprise Resource Planning (ERP) software, this is only one step in the right direction. Supplier Relationship Management (SRM) software goes some way towards giving an overview of the supply chain, but it is not agile enough in itself; more is needed to ensure the longevity and continued growth of many distributors. There is a process by which distributors can make the move towards supply chain digitalisation. To begin, they need to gauge peaks and troughs in demand, and existing ERP/SRM software is sufficient to produce this data by tracking the movement of goods through the warehouse system. The second part of this process involves using this data to optimise both the warehouse operation and supply chain logistics. In order to achieve this, businesses need to move beyond SRM and ERP; they need specialist warehouse optimisation software that automates order planning against real-time stock level data to allow order planning to be digitally linked to predictive analytics. This will ensure a high percentage of order fulfillment without overstocking. This second step involves the purchase of add-on inventory optimisation software to ensure that excess stock can be moved to where it is needed, further preventing stock outages and overstocking. Small- to medium-sized businesses no longer need to stress about the cost of the software and the upheaval of installing new hardware. Most storage and planning software is available as Software-as-a-Service (SaaS) which uses the Cloud for data storage and processing. The Cloud is more secure than many think and, owing to the Internet of Thing (IoT), allows access and processing inputs to take place anywhere from smart devices. SMEs will be able to take advantage of Cloud-based storage for huge amounts of data without needing to invest in storage servers, and many types of software are retro-compatible with existing ERP/SRM packages. With the increased globalised complexity of modern supply chains and increasing customer expectations, SMEs are at risk of being left behind by failing to digitalise their stock and logistics processes. The software is easy to integrate with existing packages, and both the service and installation costs are affordable. SMEs should therefore consider whether they can afford not to take part in the digital revolution. 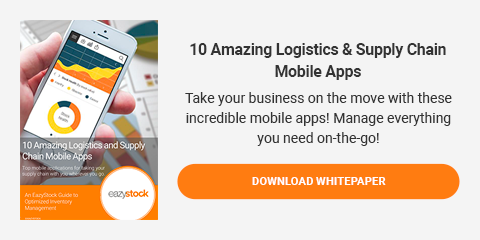 With so many options for setting up a digitalised supply chain, here are a few apps that could help you get started!